It’s a dangerous prospect, given how many times it’s already crashed, but I’m typing this on a Windows 8 laptop. Yesterday, Microsoft released the next free public version of its new Windows 8 operating system. Though it’s called a “Consumer Preview,” I can’t help but note how much more like a beta it feels. It’s come a long way since the Developer Preview was released a few months ago. If you have a spare Intel-based laptop or tablet (we installed it on an HP Folio 13 Ultrabook), you can download and install it for free, but we must warn you: It’s still riddled with bugs and incomplete functionality. Then again, can we expect otherwise? Also, check out our picks for the best Windows phone. Before I begin my diatribe on what is good and bad in the new pre-release of Windows 8, perhaps I should explain what it is. Windows 8 is Microsoft’s attempt to bring the many fantastic and sensible innovations that Apple’s iPhone, Google’s Android, and Microsoft’s Windows Phone smartphones have brought to the world of computing. And it’s also an attempt to rework Windows as a “touch-first” operating system, meaning that its interface is simple and designed to be used in touch tablets similar to the iPad. Future laptops and PCs will likely have touchscreens as well. That’s just the direction things are headed. So Microsoft’s goal is to create one platform that can serve a keyboard and mouse just as well as a touchscreen. It’s a difficult problem to solve and there is no easy solution, but Microsoft has taken a uniquely Microsoft approach. It is hoping to please everybody by including a near-complete version of Windows 7 and a brand-new interface based almost entirely on Windows Phone 7. The new Windows Phone “Metro-style” user interface has all of the best features of smartphones: apps that install (and uninstall) with ease, a more flexible homescreen, an app store, much simpler menus, an email app, a calendar app, other basic apps, and the ability to perform tasks while the computer is ‘sleeping.’ These are just a few benefits, of many. The only downside is that smartphones and tablets have not yet been home to the complex, professional applications and features that PCs are known for. It may be more fun to check your email in one of these interfaces, but when you want to use Photoshop, there’s just no way. This is why the Windows 7-like desktop is also present. Microsoft calls this mishmash “no compromises,” and it may be right, in a way, but it ain’t “no complaints.” Not just yet. Below are the good and bad points of the Windows 8 Consumer Preview. 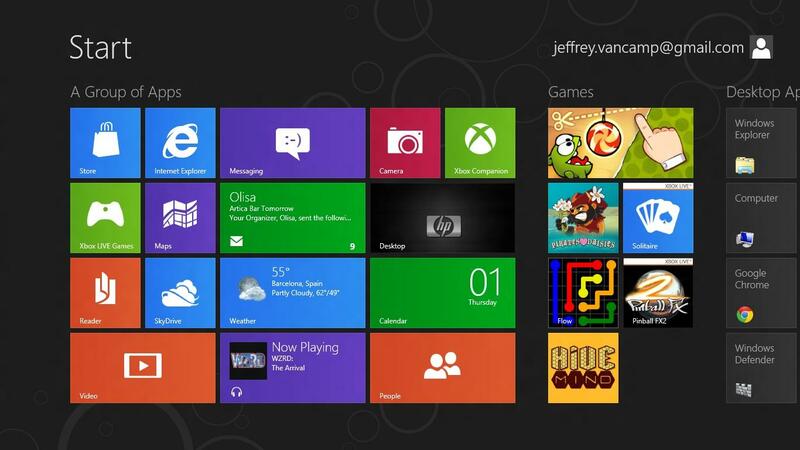 In a recent article, I laid out five features Microsoft should add to Windows 8 in the Consumer Preview. These included a proper app list, usable multitasking, a cleaner classic desktop, more flexible live tiles, and alternatives to the Windows 8 store. Surprisingly, many of these points were fixed. Perhaps my demands were too reasonable? 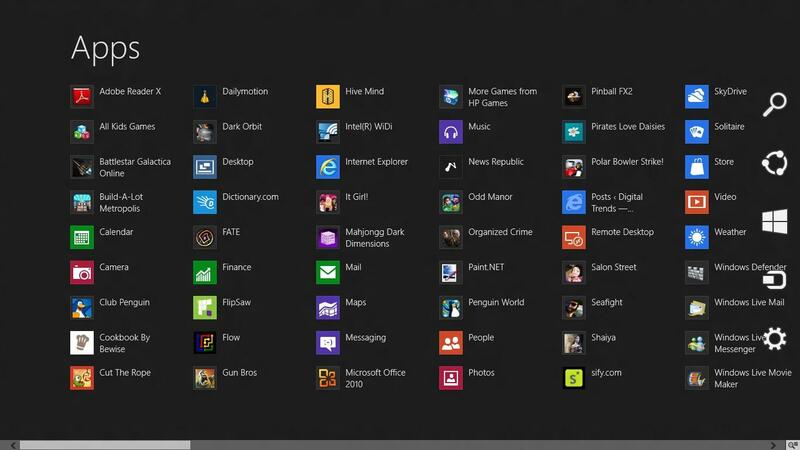 An Apps List: In the Developer Preview, there was no list of installed apps — something that’s present in Windows Phone. The Consumer Preview fixes this. A full list of apps is now accessible with a right click, and it is glorious. You can uninstall apps, pin them to the Start Screen, and perform a number of other actions from this screen. Easy peasie. Better still, Windows 7 apps and features are also in this list. Right clicking: Speaking of right clicking, Microsoft has added it in. When you right click (or swipe down from the top or bottom of the screen on a tablet), menus will pop up on the top or bottom filled with app-specific options. This opens up a lot of possibilities for app creators. Charms bar: Swiping in from the right side of the screen (or moving your mouse to the lower or upper right corners of the screen) brings up the improved charms bar, which has app-specific settings, PC settings like Wi-Fi and volume, a sharing button, and a devices button as well as a link to the Start Screen, if ya need it. The app-specific settings do seem a bit repetitive since the right-click menus should accomplish that, but oh well. The Charms bar actually works. Start Screen customization: You can’t yet resize pinned Live Tiles, but you can now move them around with ease and create your own groups of apps. If you want to name those groups, just hit the zoom out button on the lower right corner of the screen and right click the group you wish to name. It’s all quite intuitive. 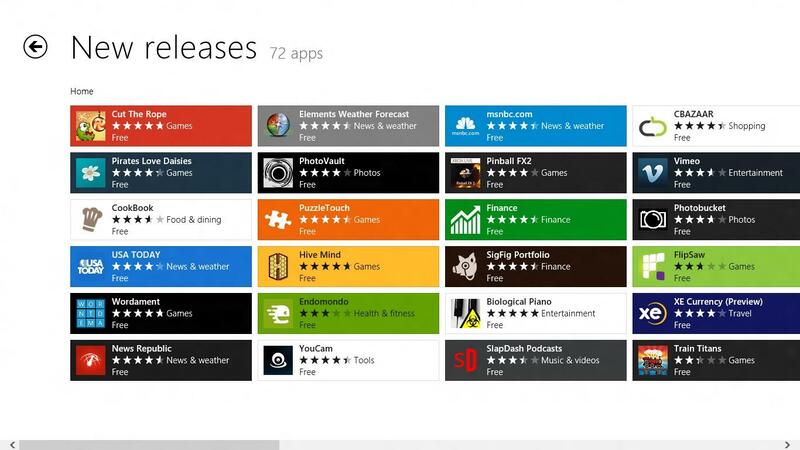 Windows 8 App Store: The app store is quite new, but it’s already working out well. Installing apps is a one-click process, as is removing them. The Windows Store will have paid content when W8 launches, but for now, you can download anything. There are about 100 apps — perhaps a few less. Windows 7 applications can also be downloaded and installed in much the same way that they have been installed since Windows 95. You can download Windows 7 applications from the Web, or install them in all the ways that you used to like CD, DVD, USB, or SD. Multitasking: There are still problems with multitasking, but you can now grab more than just your previous app by swiping in from the left side of the screen (or moving your mouse to the upper left). A listof the last six or so open apps displays on the left, much like how Android tablets or Windows Phone displays previously used apps. Alt + Tab now works as well, so you can swap between apps that way as well. Windows 7 is a bit better looking: The Windows 7 theme has been reworked ever-so-slightly to look more square. 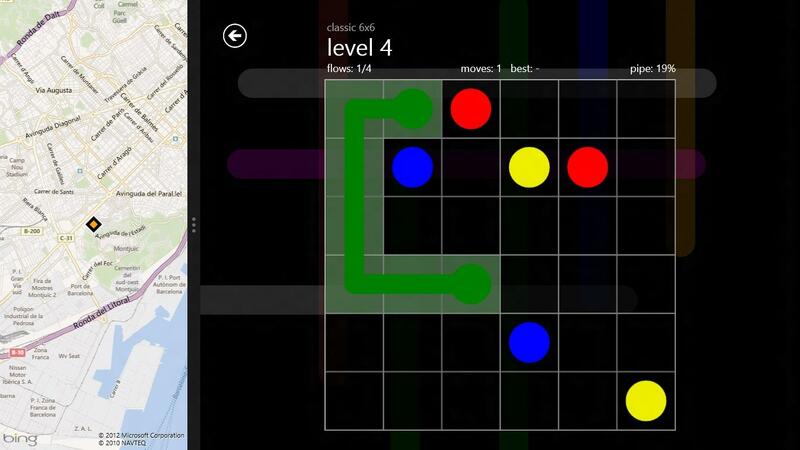 Flow: This is an ugly little color-pipe-connection game, but dammit, it’s addictive. I’m on level 31 and I cannot stop playing. I’m a Flow master. Try it out. While many issues were addressed, some fundamental ones remain, as do more than a few big bugs. Multitasking: While we like the improvements to multitasking, it still doesn’t feel as fast or fluid as it could — not by a long shot. Using the four-corners interface with a mouse is a bit awkward and I can’t stop accidentally performing unintended actions. It’s also hard to drag apps where you need them to go. You can also drag apps off the screen to shut them down, but it’s difficult to do with a mouse. Reliance on Windows 7 desktop: As Microsoft continues to add features to Windows 8, the role of the classic Windows 7 desktop has diminished, but it’s still far too crucial to the Windows 8 experience. 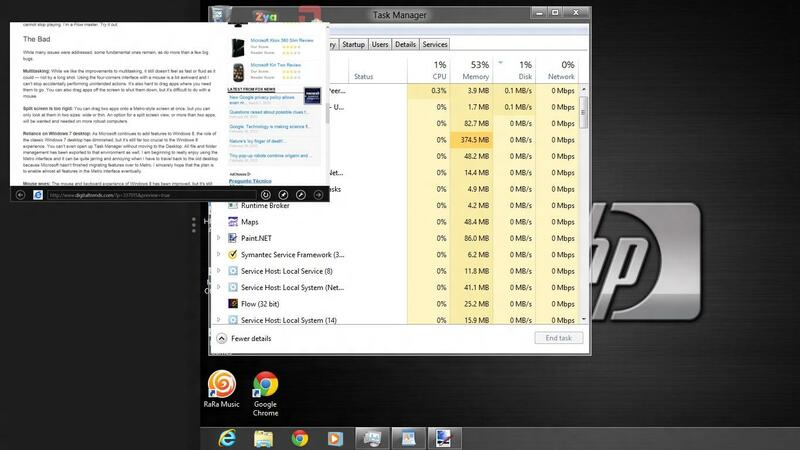 You can’t even open up Task Manager without moving to the Desktop. All file and folder management has been exported to that environment as well. I am beginning to really enjoy using the Metro interface, and it can be quite jarring and annoying when I have to travel back to the old desktop because Microsoft hasn’t finished migrating features over to Metro. I sincerely hope that the plan is to eventually enable almost all features in the Metro interface. Split screen is too rigid: You can drag two apps onto a Metro-style screen at once, but you can only look at them in two sizes: wide or thin. An option for a split screen view, or more than two apps, will be wanted and needed on more robust computers. Mouse woes: The mouse and keyboard experience of Windows 8 has been improved, but it’s still not ideal. Windows 8 menus are built around swiping horizontally between screens (like pages), but the mouse isn’t built for this. It’s good at finding a specific pixel and poking it. The Start Screen now lets you scroll to the right by pushing your mouse to the edge. This solution works decently, but few apps support it. If you happen to have a scroll wheel (meaning you’re using a mouse and not just a touchpad), that is also a great way to move from side to side, but again, many apps do not support it. 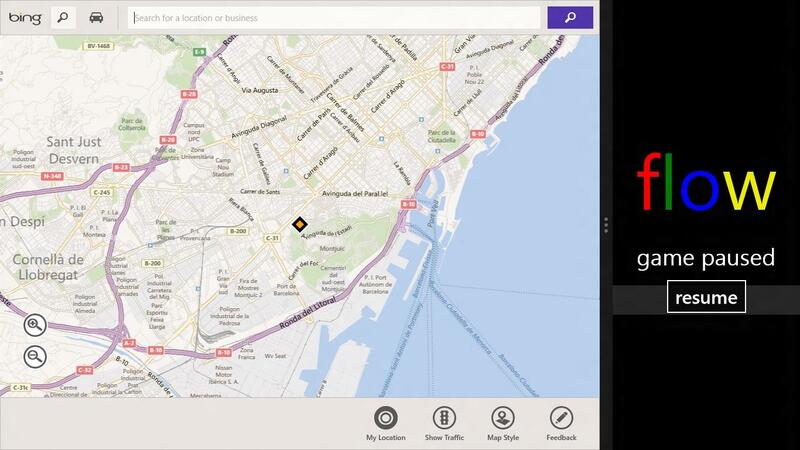 Microsoft needs to ensure that consistent navigation styles are baked into all apps. Glitches and crashes: In the last day, Windows 8: CP has crashed, or slowed to a crash, about half a dozen times on our HP Folio 13 Ultrabook. Apps like Cut the Rope don’t work at all and desktop browsers like Chrome and IE 9, which we loved so dearly in Windows 7 are rendered useless in the upgrade to Windows 8, despite the fact that they should work. Most other apps seem rushed and are quite feature incomplete or broken. With the Consumer Preview, Microsoft has shown that it does seem to be on a good trajectory with the interface of Windows 8. It’s hard not to feel like the company bit off more than it could chew, but it’s fun to see Microsoft innovating in big ways again. I am still using my Windows 7 machine more than Windows 8 due to some of the issues present, but if the final version of 8 is as much of a leap as this is from the Developer Preview, Microsoft might have a fighting chance to retain PC dominance and regain some excitement. After that, Steven Sinofsky and his team just need to figure out how to upgrade Windows more than once every 3 or 4 years. Windows releases shouldn’t correlate this closely to presidential elections. People select new electronics every day, not every 3 or 4 years. Update 3-02-2012: Clarified text on installing Windows 7 applications.